Depending upon pre-military training or post-high school education, a recruit can actually join the military at a higher rank than the typical E-1 ranking where most members of the military begin. Certain categories of enlistment entitle the recruit to enlist at a pay grade higher than E-1, effective the first day of active duty. However, while individuals are paid at the rate of the advanced grade, they do not wear the rank (or rating, if in the Navy) until basic training graduation. All recruits in boot camp are considered to be E-1s for administrative and training purposes. Many of the skills you learn at a vo-tech school can lead to advanced pay and ranking upon entering the military. Often, the military will offer follow-on training in the vocational and technical skills as you advance with your time in the military. If a recruit spends a year or two in classes and training programs he or she can graduate boot camp as an E-2 or E-3. A recruit who has satisfactorily completed one academic year or 1,080 classroom hours at an accredited vocational/technical school beyond high school level is eligible to enlist at E-2. To enlist at E-3, a recruit must satisfactorily complete two academic years or 2,160 classroom hours at an accredited vocational/technical school beyond the high school level. The ranks will be applied after successful completion of basic military training (also known as boot camp). Having a year or two of college can also help you advance into the E-2 and E-3 ranks immediately after boot camp. 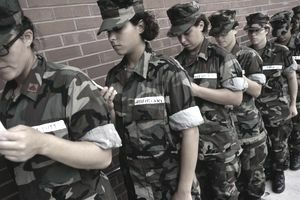 Some branches and jobs allow for the advancement to E-4 after secondary schools if a full college degree is obtained before boot camp/basic training. For E-2 you'll need 24 semester hours or 36 quarter hours of college credits; E-3 requires 48 or more semester hours or 72 or more quarter hours. There are many high schools that are affiliated with the military or reserve units and provide Junior Reserve Officer Training Corps (JROTC) or an equivalent training program for its members. These participants are granted advanced ranking after two or three years of attending such a school. For E-2, completion of two years and graduation from an accredited high school level Military Academy is required; for E-3, you'll need at least three years and must graduate. After successful completion of boot camp or basic military training, you will be advanced to the appropriate ranks depending upon your term of training in JROTC within this military academy. Many high schools across the country also offer Junior Reserve Officer Training Corps (JROTC). Learning the basics of uniform etiquette, marching, honor guard events, as well as training trips to nearby military bases allows for JROTC students to advance in rank upon completion of boot camp/basic training. Successful completion of requirements for Eagle Scout or the Girl Scout Gold Award makes recruits eligible to enlist at E-3. If you know you want to become a pilot or involved in aviation in your future, join the Civil Air Patrol (CAP). Kids ages 12 through 18 may join CAP as cadets and remain cadets until age 21. Learning to become pilots, and receiving a license to fly gliders are a few of the opportunities available to members of CAP. If you qualify for the Billy Mitchell Award (named for an Army general considered to be the "father" of the Air Force), you're eligible to enlist at E-2. Another nonprofit program allows for advancement to E-2 after serving three years, graduating high school, and reaching the rank of Young Marine/Sergeant if the recruit enlists into the military. Several Navy enlistment programs, such as enlistment in the Nuclear Program, enlistment in the SEAL Challenge Program, and enlistment in the Advanced Electronic Field/Advanced Technical Field (AEF/ATF) programs offer accelerated advancement to the grade of E-4. In general, these applicants enlist at the grade of E-1, then receive an accelerated promotion to E-2 after graduating boot camp. After minimum time-in-grade (nine months as an E-2) during technical training (or A school, as the Navy calls it), they are promoted to the grade of E-3. After completion of A-School, they may be promoted to the grade of E-4. These programs do not preclude enlistment at pay grade E-2 or E-3 under the above programs.